When you first step into Madame Monsieur, you’ll find yourself slightly disoriented. Though it may feel silly, you’ll be tempted to turn around and make sure you’re still on 6th street. That you didn’t just step through a magical portal. Because inside this unassuming little sandwich shop in the heart of downtown LA, it looks a whole lot like Paris. It smells like Paris. And if you listen closely, it even sounds like Paris. The place is small but the details that emulate the city are distinct. There are fresh pastries and baguette sandwiches displayed on the counter, small wood tables crammed along the walls, and a stack of french magazines sitting on a shelf. The flower vases and pots are charming in their incongruence and the old copper tea pot by the window gives the impression of a personal souvenir. You may feel like you’ve just stepped into a Parisian apartment, belonging to a host with very good taste. But before all that, you’ll surely notice the striking smell. Or accumulation of smells, that one might imagine wafting through a Parisian café. The irresistible aroma of freshly ground coffee, the seductive scent of melting butter, the comforting whiff of toasting bread. And if you stop and listen to the chatter in the kitchen, you’ll probably hear a bit of French too. 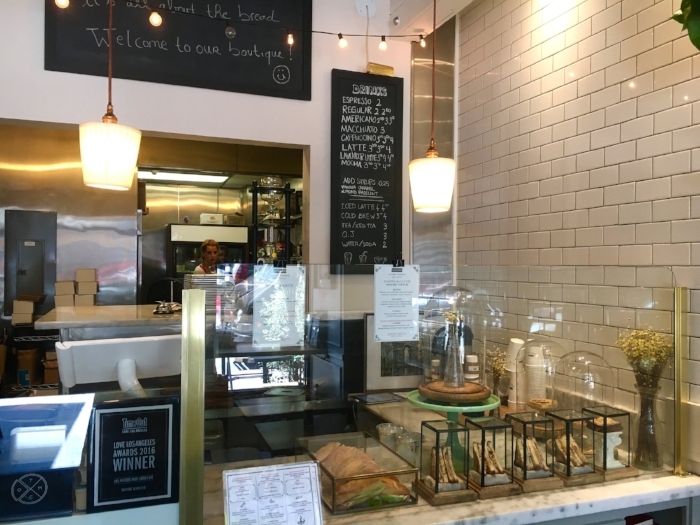 It’s not just the greeting of “Bonjour” from behind the counter but it’s the rapid conversations between Alison Barber, Kerian Jarry, and Sophie Clerico, the family team that owns the shop. Like many Parisians natives, their English is close to perfect, but it’s a treat to hear them converse in French. While we’re sure you’ll be tempted by a pastry or two, the cannelé and kougin-amman are must tries, this week’s OTM item from Madame Monsieur is the mini truffle croque madame, a decadent french classic that won’t disappoint. The sandwich is rich, with more than one layer of cheese, but don’t worry, it’s mini, so you’ll have room for those desserts. To learn more about this adorable croque madame and about the madames and monsieur behind Madame Monsieur, we sat down with owner and chief creative officer, Kerian Jarry. Why the Mini Truffle Croque Madame as your Off the Menu item? Our place is called Madame Monsieur because the croque madame and croque monsieur are our flagship products. But we’ve been established for two years now, so we wanted to create a new concept of the croque madame and have a little fun with the original idea. The inspiration for the small size came from a trip to the market, where we go every weekend. We saw tiny quail eggs and we wanted to do something with them. We then decided to add truffle oil to the sandwich to give it a little twist and make it truly different form our regular croque madame that we serve everyday in-house. Where did you learn to make a croque monsieur? This is a family business and we are all from Paris, so I think we learned just from eating the sandwiches all the time. The croque monsieur and croque madame are the common sandwiches that you eat for lunch in Paris, so we knew what it tasted like and how we wanted it to taste. Also Alison has been trained in a Michelin star restaurant so she has more of a restaurant background. When we came here, we had to find how to make it taste the same as it does in France, so we import the cured ham and the dijon mustard. It’s a simple dish, but it is only good if you have good ingredients. What’s the most important step or component to making a good Truffle Croque Madame? A good friend of mine is a very talented chef in Paris and he suggested using crème fraîche instead of béchamel to make the sandwich lighter. That’s our special secret ingredient. But the steps to making the sandwich are easy. First we have two slices of pullman bread, the fresher the better. Then we add creme fraîche, dijon mustard, cured ham, swiss cheese, salt and pepper. Then we close it, put a little butter of course, creme fraîche again, and then swiss cheese. This extra layer of cheese is important. I think we were often disappointed with the croque monsieur when we first came here because most of them were missing this last layer of caramelized cheese on top. They were more like paninis. For the croque madame, we then fry an egg on the side and put it on top at the last second. Which side dish on the menu pairs best with the Truffle Croque Madame? We serve the truffle croque madame with a side of micro greens topped with olive oil and a homemade fig glaze. What else would you recommend that an OTM member orders? Our other sandwich that we are famous for is the ham and butter. It is made on a very good baguette, which we call a retro baguette, because it is done in the old style and the time it takes for it to cook is much longer than a regular baguette. It is very airy, chewy, yet crunchy at the same time. So the ham butter sandwich is just the retro baguette, butter, ham, and cornichon. It is very simple but that’s the secret. Our coffee is also very good. We are now working with Suits & Knives. They have a Japanese technique of roasting their beans that provide a great balance of flavors, with citrusy yet chocolatey notes. Do you make your pastries in house? No, we have a commissary, so we do make them but not in-house. We work very closely with BreadBar, one of the oldest artisan houses for pastry in L.A. If you come here for a pastry, you come here for the kouign amann, which is made with croissant dough and sugar. Do you create new sandwich recipes often? Every season, we come up with new sandwich recipes for each of our different types of breads. Right now, for example, we have a wasabi tuna for the mini pullman sandwich, we have roast beef and mango chutney with a remoulade sauce for the toasted baguette, and for the retro baguette, we’re doing a vegan sandwich. For our seasonal sandwiches, we try to add a twist that you wouldn't find in France and is inspired by our surroundings. Will you guys be expanding Madame Monsieur anytime soon? We are actually trying to expand in a different way. Right now, we are launching a new line of sandwiches. The concept came from being tired of the airport triangle sandwiches that taste bad and cost a fortune, so we designed our own packaged sandwiches with artisanal bread and fresh products. Each sandwich has its own packaging, like you would see in the chocolate industry. The idea is to work with coffee shops or locations that don’t have kitchens but want to sell quality products to compliment their coffee.